The year is 2000. The world has survived the Y2K bug and Steven Spielberg is about to start shooting his new film, A. I. Artificial Intelligence. The story, written by the late Stanley Kubrick, features a world in the late 21st century, a world where global warming has flooded coastlines, and a drastic reduction of the human population has occurred. The main character of the film is David, a 12-year-old childlike android. In the role of David we see Haley Joel Osment. It is day one of shooting and Haley Joel Osment slowly approaches Steven Spielberg. The young actor who rose to fame two years earlier with the film The Sixth Sense is excited to talk to the director, the person who made his favorite movie, Jurassic Park. Only minutes before filming his first scene Osment is eager to say something to Spielberg that has been bugging his mind for the last couple of days. The 11-year-old child is of course nervous, he is about to point something out to the director, something that could be taken as criticism. Something that Osment believes that Spielberg has forgotten to include in the character description of David, the child android. But something that Osment has been thinking about. Osment knocks Spielberg on his lower back. 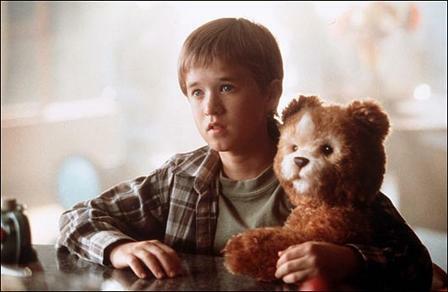 Haley Joel Osment is never seen blinking in the movie A.I. Artificial Intelligence. This entry was posted in Film, Uncategorized and tagged 2000, A. I., A. I. Artificial Intelligence, anecdote, Artificial Intelligence, Haley Joel Osment, Hollywood, Jurassic Park, movie, Stanley Kubrick, Steven Spielberg, The Sixth Sense, Y2K on February 2, 2015 by Sebastian Lindholm.